CAMP HANSEN, Okinawa, Japan — From a distance, many people would have thought Leo Gallagher, better known as the watermelon-smashing comedian Gallagher, was performing here. A Marine's muscular arms made one huge circle sweep with a large wooden hammer and "thud"...no splash, no running from the scene or plastic bags on the audience; men and women continued to pound into a hole in a huge piece of wood. Approximately 20 Marines from 7th Communication Battalion, III Marine Expeditionary Force, Headquarters Group, attended the Mochi Tsuki annual rice pounding ceremony Jan. 16 at the Hikuga Oka Nursing home. This tradition is said to bring in the New Year with prosperity and good luck. After ground golf, everyone gathered in an area where there were two bowl-like wooden stumps set up. 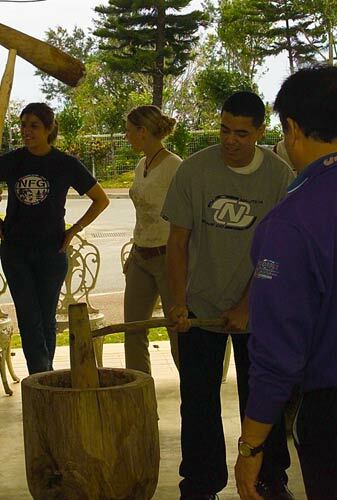 The staff at the home brought out four wooden hammers and explained the rice pounding ceremony and how to make `mochi', a paste used to make candies and other baked goods. Once the Marines were told how the rice pounding worked, they were presented hammers and began to pound the rice into the sticky mochi. The Marines were divided into teams of two and took turns swinging the hammers. Each team pounded the rice for a few minutes and then passed the hammers to the next team, each beating the rice into the sweet confection. "This is not just something that takes place at the nursing home, this is an Okinawa-wide event," said Lt. Mike Peyton, chaplain. While four Marines were at the bowls pounding rice, there were some Marines who took to the karaoke machine. Everyone enjoyed the camaraderie of the day, according to Lance Cpl. Bobby Dannels, radio technician. "Its all fun. If people like my singing that's good, if not, at least they got a good laugh," Dannels said. At the end of the day, the event helped to continue the 10-year relationship between the nursing home and the Marines of 7th Comm. The Marines left the nursing home with a feeling of pride and accomplishment in having brought goodwill to the community, according to Lance Cpl. Travis Green, radio technician. "Going out to the retirement home was a great experience for all of us, we got to hang out with the Okinawans and play a little golf," Green said. "It brought us closer to the community. It shows them that Americans aren't the worst people out here and that we're here to help them."